And my spirit rejoices in God my savior. For he has looked with favor on the lowliness of his servant, surely from now on, all generations will call me blessed. For the mighty one has done great things for me, and holy is his Name. His mercy is for those who fear him from generation to generation. He has shown strength with his arm. He has scattered the proud in the thoughts of their hearts. He has brought down the powerful from their thrones and lifted up the lowly. He has filled the hungry with good things and sent the rich away empty. He has helped his servant Israel in remembrance of His mercy. According to the promise, he made our ancestors to Abraham and to his descendants forever. What you just read is Mary’s Magnificat, Mary Song. When Mary was pregnant with Jesus, she sang that song. I think Mary was a very special person. I wonder how a young girl could have such maturity. I mean, maybe that’s why God chose Mary to send Jesus Christ to us. A virgin getting pregnant. That was difficult news to accept even now, 2000 years later. But during that time, a virgin being pregnant was unacceptable. And Mary was shocked when she first heard that, but she was calm and handled the situation in a very mature way. Not only that, when you read today’s scripture passage, what Mary’s saying and what Mary said was just amazing. She understood exactly why Jesus came to this world. She had a great insight about the baby she was pregnant with. Let us go back to the story of Angel Gabriel first coming to Mary telling her that you’ll be pregnant. The Angel Gabriel was the one who first broke the news to a Mary. But the Angel Gabriel said a wonderful thing about the child that she was going to give birth to. And the Angel said that the child will be great. He’ll be called the Son of the most high and God will give him the throne of David. He’ll be the king of the kingdom. That will have no end. What a wonderful news. Let’s say you’re pregnant and then somehow in the dream angel came to you and then broke this news to you. You’ll be so amazed. Wow. The baby that I will have will have this kind of character in the future. Just the other day, Joshua called me then said, “Dad, can I talk to you? Yeah, I got to go right now, but it takes one minute.” “Okay. What is it?” So, he broke the news with me. I was so happy. He said they’re going to have a daughter. “Yeah? Really, I get that. Other things can wait. Talk.” So, we talked to for about two minutes. I mean even that news made me so happy, but the kind of news, Mary got, it was just amazing news. But after hearing all that, you know, what was Mary’s response? This was Mary’s response. How can this be? Since I’m a virgin, she could not hear anything, Angel Gabriel Said. She only got shocked by the fact that she might be pregnant. That’s the only thing that she could remember. It is totally understandable. At that moment she couldn’t hear anything else, but as time went on, when she was calm when she thought about it, she started hearing. She remembered what Angel Gabriel said. Yeah, the Angel told me the baby that I would have would be a great person, but after this, she sang this song. 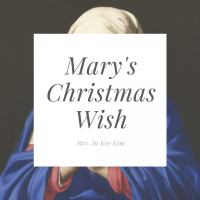 When you hear Mary Song today, it is very different from what normal parents expect from their child. Normal parents will be very happy that their child will be powerful, famous, and great, but Mary was different. She wasn’t concerned. She wasn’t concerned about her child being great, powerful, and famous. She was able to see what this child would do for humanity. Even at that moment, she was thinking about the poor, powerless, voiceless, and this child would give them the power. Give them the voice. And most of our parents or when we pray for our children, we just pray that they will be healthy. They become great. They get a good job and all these things. We only pray for their wellbeing, but Mary wasn’t concerned about him being great. Mary was concerned about what this child would do for the humanity, for the people who have no power. What a profound and amazing woman she was. She was a little girl maybe 16 or 17 at most, and she had such a profound insight about Jesus. So, when you, your parents, and all the parents here, when you pray for your children, don’t just pray for their wellbeing, pray for them to have an impact for the people who are less fortunate than them. Pray for your children to live their lives, to uplift the lowly, powerless, and voiceless. This is what humanity is all about. That’s why Mary was able to accept the death of Jesus, the death of her own son at the cross. She was there. She saw the tragic death on the cross of her son and she was able to digest it because she understood that he had to do it to bring up the lowly, the humble, and the hungry. So, she was able to accept that. Mary’s Christmas wish was for the powerless to have power, the voiceless to have the voice and the poor and the hungry to be filled, but the rich and powerful she wished that they will be sent away empty. Profound theology for a little girl only 16, 17 years old. Mary knew clearly the Christmas message. This is how we human beings should live. This is the value and morality we should uphold. This should be our lifestyle. We are living in a culture where we idolize the power, the fame, but Christian message or Christmas message is totally different the exact opposite. We need to be aware of this message always. We should always think about those around us who have less power than us, less privileged than us, and we should share the power that we have with those who don’t have any. That is the life of sharing. That is the spirit of this year’s theme. Serving is living. My friends, we have so many blessings from God. Let us share our blessing with others. That is the spirit of Christmas, that kind of life that will have a positive impact on other people. You know we don’t give not because we don’t have money, we don’t give, not because we don’t have any, we don’t give because we have no room to think about others. We are so wrapped around by our needs, but your needs are endless. At one point it’s got to stop. You cannot wrap yourself around by your needs alone. There are people who have more needs than us. If we pay just a little attention to others around us, we can do so much for them. We will be able to see many opportunities to help them. Even at the store, if they ask for a donation, whether it’s a Sick Children, whatever, give. Even if you gave five times, give again, just give. Don’t think too much about it. You have enough. Kahlil Gibran, one of my favorite poet, He said, “you give, but little when you give of your possessions, it is when you give of yourself that you truly give.” That’s the lesson Jesus taught us. He gave off himself, giving life starts from our heart. There must be a desire to live a life of giving in our heart before we actually live a life of giving. When we believe that that is the right thing to do, then we’ll be able to share with the others. That our hearts will move, and our eyes will be able to see the opportunities and if we can live a life of sharing, and I believe that that is a meaningful life. You want to live a meaningful life. I believe that that is a meaningful life. As we live a life of giving, our life will be larger than ourselves. Your life will be larger than yourself. You will become a big person. Be a big person. That’s what’s cool about giving life. Being a big person. Mary was a young girl, but she was a big person. She lived the life larger than herself. Jesus was a big person. He gave all of himself for us. That’s why Angel Gabriel announced this way. He will be great, and Mary knew the meaning of being a great person. Mary was not only a big person, but she was a blessed person and Mary’s said this, “my soul magnifies the Lord and my spirit rejoices in God my savior, for he has looked with favor on the lowliness of his servant. Surely from now on, all generations will call me blessed.” She was a blessed woman. When the lowly person starts living a life of giving day, they become precious people and blessed people. When we live a life of sharing our life becomes precious. You become a very precious person. I want to share a little quote from Winston Churchill to end my sermon. “We make a living by what we get. We make a life by what we give.” Profound. This is the Christmas message.